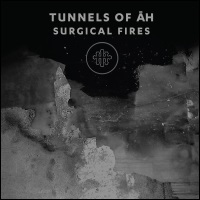 Right from its unsettling introduction Surgical Fires, the third album from Tunnels of Āh, follows a much harsher course than is found on their previous albums Lost Corridors and Thus Avici. Lost Corridors was a psychogeographical musing on tunnels and structures while Thus Avici meditated on the new dark age. Like the preceding albums, Surgical Fires is naturally informed by Stephen Āh Burroughs' studies and practice of Buddhism and his abiding interest in the esoteric. Buddhist texts appear woven into the fabric of Surgical Fires but their hushed delivery amidst the noise textures makes them hard to decipher. One track features Anji Cheung, a London based sound artist. She's a natural fit as Cheung, like Burroughs, in her own work sculpts unearthly drones and bleak atmospherics and shares an interest in the occult and Buddhism. Cheung provides vocals to one track, on an album that seems more instrumental than previous releases. The assemblage of percussive elements and electronic noise places Surgical Fires in the lineage of industrial music, a sound that has fired Stephen Āh Burroughs since the early eighties. It is by far the harshest of the three Tunnels of Āh albums which might not be surprising since it seems to be concerned with psychic attacks. I'd hazard a guess that the work of Dion Fortune and particularly her anecdotal study Psychic Self-Defence plays a role on Surgical Fires. Surgical Fires best fits Tunnels of Āh intent: This is psychick war. Surgical Fires open to the processed industrial clank and clatter of 'Demonic Forms'. From the series of pummels, scrapes and scratchings underneath an electronic roar, rises, let loose like a rampaging surge of insectoid chattering. The relentless onslaught is like an audio take on the occasional episodes I experience when my head is subject to careering thoughts rendering me unable to focus on anything specific. Mines may be the result of constant tiredness but Surgical Fires is dealing with psychic attacks. Keening metal and oblique wordless chants only add to the confusion created by this ugly spirit, and then there is the added whirr of a drill. This is the sound of trepanation, a bore hole driven into the skull to relieve the pressure. And at the hands of Tunnels of Āh it also acts as a portal into the mind. The following track 'Purging Process' harnesses electronic noise textures with a hazy mishmash of discordant frequencies and buzzing electronics as it battles with the hungry ghosts. Set against this are elements of ritual clang and what may be discordant guitar howls. Is it? I can't be sure, as I don't think guitars have featured on any of the prior Tunnels of Āh albums but it's not out of the question as remember Stephen Āh Burroughs was once part of the noise rock outfit Head of David. Burroughs voice appears on 'One Hundred Gates + Eight', another title illustrating the influence of Buddhist text on his work. Reduced to a spoken whisper over layers of ominous eviscerating drone. His words cloaked in buzzing drone seem to be a homage to and about the protective nature of the Buddhists and the sacred words of the Dharmas. Buddhism may imply a sense of stillness but Tunnels of Āh fill their tracks with unsettling drones, glistening tones and morphing sound shudders. 'Mind As Corpse Bearer' is riddled with some seriously effective rippling tones, as a constant cranking see-saw sound runs throughout the static etched drone. No space or light manages to pierce 'Release Of The Burning Mouths'; an impressively oppressive onslaught featuring layers of deep airy droning and textured shifting layers. The title takes its name from a Chinese Buddhist ritual where the denizens of hell and hungry ghosts are invited to feast and hear the Dharma preach before being sent away. Voices take the form of bestial growls along with the breathy exhalations of Burroughs; a hushed sinister uttering cast against an evocative maelstrom of sound layers and fierce noise effects. The following 'Black Air (Exhale)' is a more textural working filled with coruscating electronics, hollow ratcheting and jarring frequencies. Just by chance, a few weeks earlier I became aware of the work of Anji Cheung who provides vocals on 'My Love To The Lordly Cobras' on a split single with the revitalised Terminal Cheesecake. Here her soft whispered tones are subject to split-channel processing, as she recites a Buddhist protection ritual over low stuttering electronic drones which swell from underneath amidst sound shimmers and flashes, before reprising the text accompanied by chants. Surgical Fires closes on 'Emission Through A Hole In The Head' which wades through crunching textures (the beginning kinda reminds me of a slowed down take of Throbbing Gristle's 'What A Day') before it morphs into more nebulous territory. Burroughs intones words performed as a looped chant, as melodic chime wafts over the crunchy textured backdrop. The collusion of sounds is quite unsettling, coalescing into a noise drenched climax before its deep drone exit.